While the iPhone is primarily a desirable smartphone that truly kicked off the full multi-touchscreen phenomenon on a mobile basis, that doesn’t mean it remains in the realm of seriousness. After all, all work and no play makes Jack a dull boy, so what better way to relieve the stress accumulated during the week with your executive lifestyle that play a couple of rounds of golf with your best buddy? The iPhone can double up as your golf scorecard in the process, so we’ll take a look at 15 of them today. 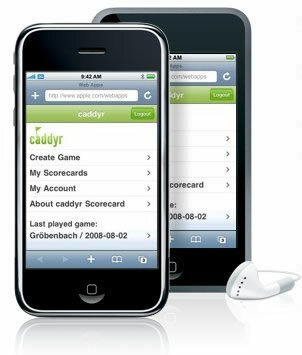 The caddyr Golf Scorecard allows you to track and save your golf scores for virtually any course you play on your iPhone or iPod touch. Once you’re done registering the software, you are able to use caddyr to track scores for up to 4 players simultaneously, forwarding them the results right after the game to the individuals in question. You can save an unlimited amount of scorecards (subject to the memory left in your iPhone) while receiving detailed game analysis to improve your play in the future. Features of caddyr include a new design, session and timeout control, advanced registration fields, data validation for email as well as other input fields, automatic re-login and a more stable working environment overall. Since times are hard at the moment, we’re pleased to report that caddyr is a free download for the masses. 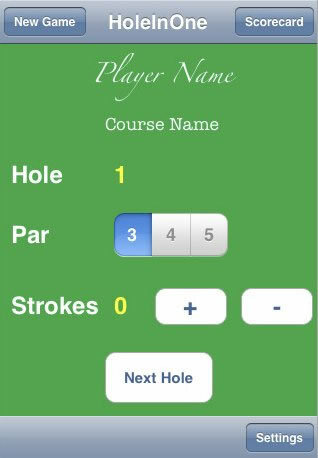 iGolfScorecard is currently in the 1.7.2 iteration and doesn’t feature anything fancy as it is a simple web application that was specially designed for the iPhone. Golfers are now able to track their scorecards while playing golf using the self-explanatory iGolfScorecard, and it can accommodate anywhere from one to four players on either a 9 or 18 holes course. 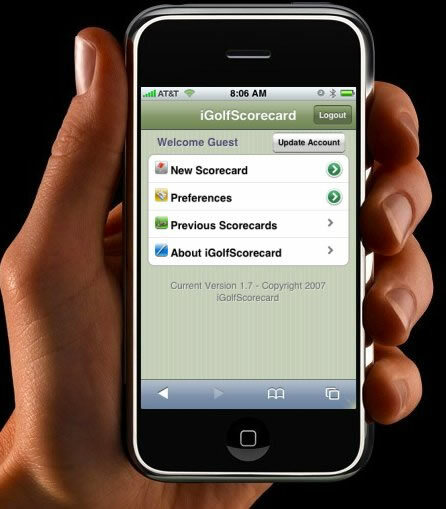 Bear in mind that iGolfScorecard can only be downloaded using the iPhone/iPod touch Safari browser, and it will be free for public use. 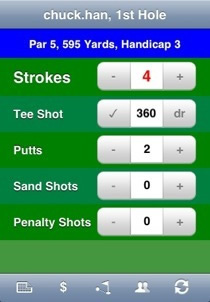 smartSCORECARD is yet another iPhone golf scorecard application that is able to track up to four different players simultaneously as they tee off. 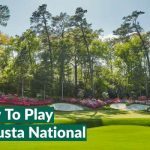 You will first need to be a member of oobgolf.com first though (membership is free), where the site will store your scores, handicap and an abundance of other golf-related data. smartSCORECARD aims to stand out from the crowd by keeping track of your score, fairways hit, distance off the tee, club used off the tee, number of putts, penalties and sandshots. 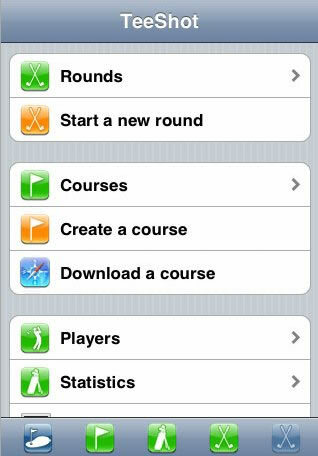 Heck, it is even capable of showing you the course layout so that you can figure out the shot distances for yourself – a feature that’s recommended for use only if you’re running on the iPhone 3G. The Birdie golf scoring application was specially programmed to meet the needs of golfers, and is easy to use when compared to standard score cards. Enhanced features of Birdie include fully automated calculation of score card results, counting the number of strokes each player makes throughout the game (maximum of four players), while keeping track of the game’s results depending on the rules involved such as “Stroke Play” and “Stableford”. 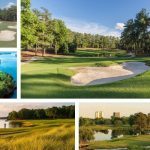 Birdie can reference an ever-growing database of thousands of golf courses worldwide, and you have the choice of adding your favorite course to the list too. Game results are sent via e-mail to your friends. Available in English, Dutch, French, German, Italian and Swedish languages, Birdie retails for $19. 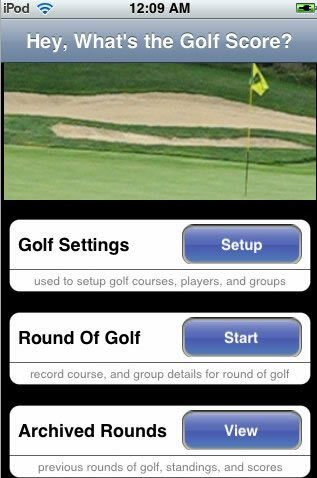 Golf-Ace helps you keep track of multiple players’ golf scores right on your iPhone or iPod touch, where various courses can be downloaded in an instant through the constantly updated online database as you wait on the tee box. Just in case your favorite course is not available, you can always use the pre-loaded course editor to create a new course within moments. Future versions of Golf-Ace are said to include round tracking statistics and automatic calculation of handicap to help you improve your game further. 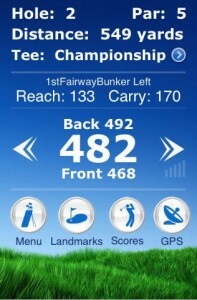 Golf-Ace will show distances in yards or meters, and it retails for $19.99. Just like any other golf scorecard application for the iPhone, Golf Memoir also keeps track the scores automatically for up to four players as they play. What makes this special is the ability to calculate the distance from the pin each time you step up to tee off thanks to the GPS chipset in your iPhone 3G, although we’d recommend you leave some allowance for the lack of pin-point accuracy. Course information can be downloaded from the application website, and you can even snap photos at each hole to share the (sweet or frustrating, we leave that outcome to you) memories later on. 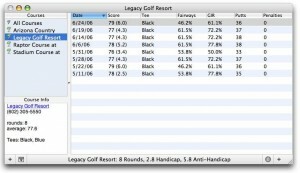 All scores can be uploaded securely to the website, where you can virtually keep a history of your game forever. 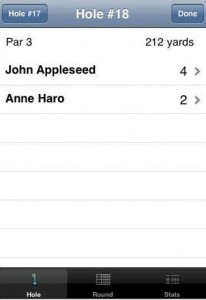 If you decide to change your phone or device, your uploaded games can still be accessible via the Internet. Golf Memoir retails for $9.99. The Golf Tracker by Mark’s Apps is pretty much run of the mill as you are able to enter your golf scores as you golf, while keeping track the running total of your rounds. 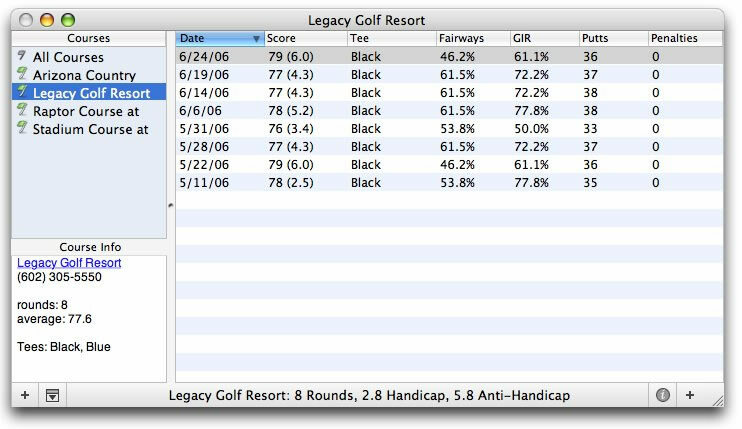 In addition, it will save your past rounds for a post-mortem later on while logging the statistics of individual golfers in your group on all holes and courses that you play. 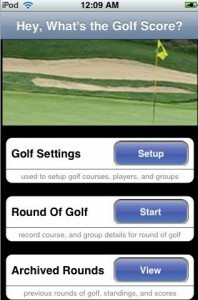 Golf Tracker is able to have a maximum score of 20 per hole and can be purchased for $4.99. Hey, What’s The Golf Score? Most of us seasoned golfers still do hear the question, “Hey, what’s the score?” from time to time as we tee off with our buds. Well, why not turn that into a marketing opportunity instead? The aptly named Hey, What’s The Golf Score? 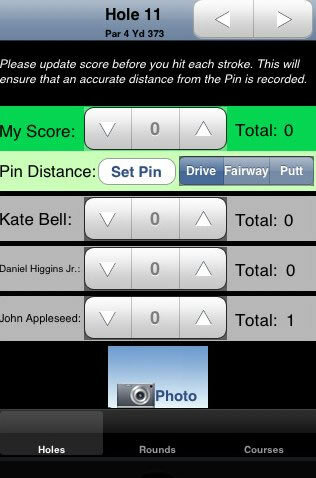 application for the iPhone and iPod touch lets you keep track of golfers, golfing groups, course information and the all important score through an easy-to-use interface for you to focus more on making that money shot instead of wondering what the score is at the moment. Hey, What’s The Golf Score? can be purchased for $3.99. iYardage is very different from the rest of the applications that we’ve looked at so far, as it offers an accurate distance to any point on the current course, making the game feel much more like a home console title instead. In addition to letting you know just how far you have to hit the little bugger with your club, iYardage also does the usual including tracking your score and game statistics in order to improve yourself further when reviewing such data after a game. Those with a competitive edge will have the option to upload their statistics so that friends and competitors can check out and hope to beat those posted numbers. iYardage is surprisingly a free download. TeeShot’s greatest strength, it seems, lies in the simple interface that makes it a snap to keep track of all the game’s details at each round so that you are able to have better control over your golf game. TeeShot is able to track your strokes, putts, fairways, clubs, distances and sand saves among others, keeping score for up to four players each round. You can also choose to compare results on the same hole across time and over all the courses you played. 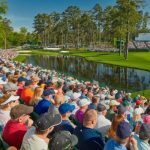 You also have the added advantage of reviewing and downloading course descriptions from TeeShotLive.com so that you are able to better tackle the course. Rounds can be uploaded to the Internet in order to obtain an official USGA handicap index. TeeShot retails for $19.99. You can download Scorecard for $29.95. vCaddy touts to offer the complete package when it comes to improving your golf game. 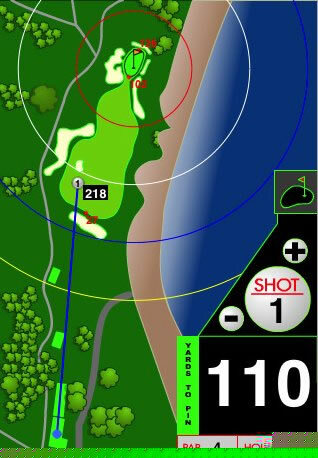 Not only is it able to keep track of the score for up to four player at any one time, vCaddy also features a GPS rangefinder, a generous database of courses (more than 6,000 and counting), POI markets as well as ball marking, all in a single dummy-proof package. In addition, vCaddy also has partial round support and continuous updates to make sure that most new courses are updated to keep you abreast of the developments. vCaddy can be purchased for $9.99. The popular GolfTraxx Golf GPS solution for iPhone 3G owners now has an update to help you improve your on-course shot decisions as well as course management. They say that knowledge is power, but we think otherwise – only applied knowledge has power, otherwise it is just untapped potential. Why not use GolfTraxx to your advantage as you know the yardages to the important green complex locations? This will definitely help your rounds end u pshorter with a lower score, alongside an increased level of satisfaction in charting your progress. All courses found in GolfTraxx (more than 20,000 domestic courses) is able to use an easy-to-use scorecard for up to four golfers simultaneously, including the total number of strokes and putts. 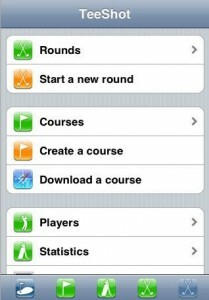 GolfTraxx is available as a free download. What can a dollar get you these days? Well, how about the HoleInOne application that is going for just $0.99? 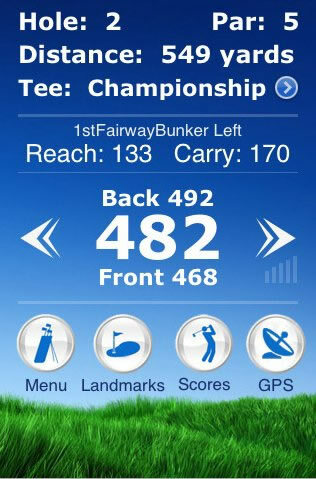 This is touted to be the ultimate golf scorecard resource for golf fans who own an iPhone or iPod touch, allowing you to record your score alongside your name and your favorite golf course. It is apparently so easy to use, you wouldn’t think twice or blink when it comes to chucking away your old manual scorecard. Sounds promising, let’s hope it lives up to its expectations. ViewTi Golf does much more than just keep the score for you, it also works great with the second generation iPhone by utilizing its GPS capability. Bar none, it touts itself to be the best rangefinder option available when it comes to the sheer number of courses supported in addition to distances and scorecards. With the FairwayView option, you are able to check out the layout of each hole as well as measure to fairway hazards and tree lines. All images will orient themselves in a forward view so that you are able to visualize your next target more naturally. 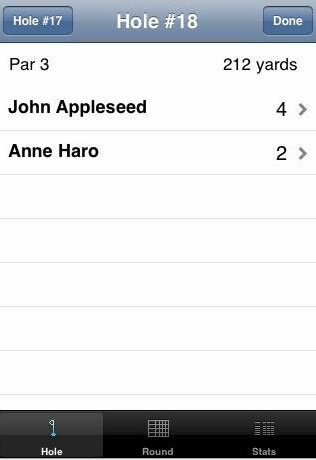 You scores can be saved onto the scorecard on the iPhone and emailed to friends later on, with the ability to store information for up to four players. Heck, it even boasts a driving mapa and directions with GPS in addition to traffic information so that you know whether it is a good time and route to take to the golf course. ViewTi Golf will weigh in at $24.99. Great article, almost worth getting an iphone just for this kind of stuff, lol! What a practical usage for the iPhone! I’m continually surprised at how many ways this little toy (not phone) can improve our lives. Now to dust of my golf clubs and check it out. Great blog post! Now we’re fully justified getting an iphone! I use GolfCard and am happy with it. It gives you distances to any point on the satellite view of the hole like many other app. It also has a very good score card. The big problem with all iPhone golf range finder apps is the speed of the GPS. The iPhone’s GPS does not perform as well as the ones found in dedicated golf GPSs. It can take 2 minutes or longer to get an accurate (sub 10 meter) fix on your position. This can slow down your play considerably and makes the apps useless on a busy Saturday on the course. No one want to play with a guy who stand there looking at his phone for 2 minutes before every shot. Anybody now of a app that doesn’t need cell service to work? I live in rural WV and there is no cell service on the local course. Would like to use my Iphone to keep track of things. is there one like that? This one just came out. 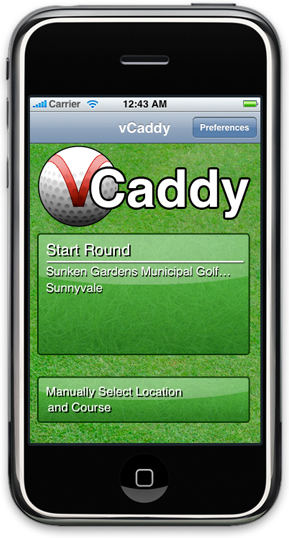 Web App that works for golf tournaments. Still in beta, but very functional. Used in a tournament yesterday. iYardage doesn’t require cell service while on the golf course. It just keeps score but it works well and its free.